Moo shu pork (also spelled moo shi pork, mu shu or mu xu pork) is a dish of northern Chinese origin, possibly originally from Shandong. It is believed to have first appeared on the menus of Chinese restaurants in the United States in the late 1960s, and is also a staple of American Chinese cuisine. In the United States, the dish seems to have appeared in Chinese restaurants in New York City and Washington, D.C. in approximately 1966. At that time, the dish was at first prepared in a traditional manner, but, as wood ears and day lily buds were scarce, a modified recipe was developed. 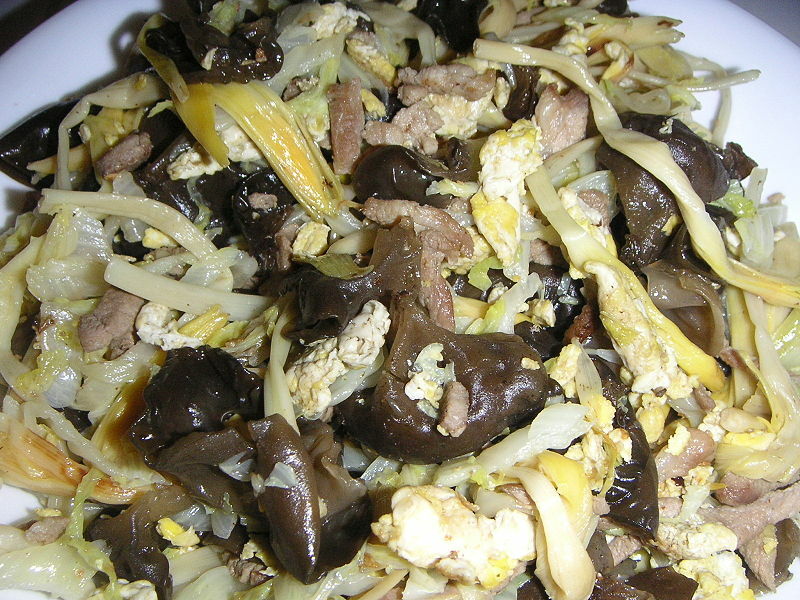 In this modified recipe, which gradually came to predominate in North America, green cabbage is usually the predominant ingredient, along with scrambled eggs, carrots, day lily buds, wood ear mushrooms, scallions, and bean sprouts. Shiitake mushrooms, bok choy, snow pea pods, bell peppers, onions, and celery are sometimes also used, and dry sherry is often substituted for the huangjiu. The vegetables (except the day lily buds and bean sprouts) are generally sliced into long, thin strips before cooking. Moo shu pork is served with a small dish of hoisin sauce and several (generally four) warm, steamed, thin, white tortilla-like wrappers made of flour, called báo bing (literally "thin pancakes"); these are similar to those served with Peking Duck. First, a small amount of hoisin sauce is spread onto the pancake, then a spoonful or two of moo shu pork is placed in the center of the pancake. The bottom of the pancake is folded up slightly (to prevent the contents from falling out), and the pancake is either folded or wrapped from left to right, in the manner of a soft taco. Unlike the practice in wrapping a burrito, the top is usually not folded over, as the pancake is generally eaten immediately and thus there is no danger of the food falling out of the top, which is the part that is eaten first.